Midnight Sun Discovers “Ore Shale”-Type Copper-Cobalt-Nickel-Gold Mineralization on Solwezi Properties – Midnight Sun Mining Corp.
*Copper equivalents were calculated using current metal price ratios and are presented only for ease of interval comparison among drill intercepts as recovery factors for various metals may vary significantly. Metallurgical work is in progress. Metal prices used were $2.50/lb copper, $14.83/lb cobalt, $4.58/lb nickel and $1175/oz gold. ** The higher grade zones in MDD-16-09 and MDD-16-01 were assayed to test for the presence of gold. Additional re-assaying for gold in other intervals is in progress. *** Denotes near surface oxide mineralization. The Mitu area was targeted for drilling as a potential location of ore shale type base metal mineralization based on evidence from geochemical and geological surveys conducted by the Company and previous operators between 2010 and 2015. Ore shale mineralization is the dominant form of copper, cobalt and nickel deposition in the Zambia-Congo Copperbelt, the largest single copper production area in the world. Mineralization is associated with shale units which form chemical and physical “traps” for base metals at or near the favourable contact between the Upper and Lower Roan units. This contact zone along the western flank of the Solwezi Dome extends for over 17 kilometers on the Company’s License areas. The 12-hole diamond drill program covered an area of 300 meters on strike direction and 400 meters of down dip extent. All holes encountered shale units with base metal sulfide mineralization at maximum vertical depths to 184 meters. This mineralization is overlain by a mantle of weathered overburden averaging approximately 38 meters in depth, hosting copper, cobalt and nickel in oxide form. The 45 Air Core Holes covered a strike length of 1200 meters, and returned significant results over this length. 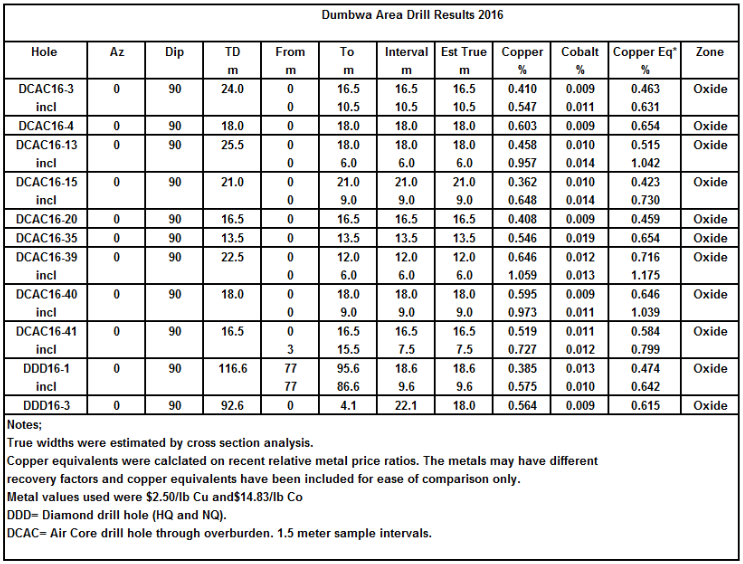 Some of the significant results from the 2016 Mitu drill program are presented in the Table below. The Company considers the Mitu area to be a priority target for further work. Geochemical work and geophysical surveys to detect the presence of conductive shale units along the favourable trend are planned for the spring of 2017 with follow up drilling at the conclusion of the rainy season. Metallurgical work to establish target mineralogies and recovery factors is in progress now and higher grade samples are being checked for gold values. Three diamond drill holes focused on extending the sulfide copper zone detected at Dumbwa in 2015 with hole DC15-03 which reported 0.88% copper over an estimated true width of 7.8 meters. Hole DC16-01 located 50 meters south of this hole reported 0.575% copper over an estimated true width of 9.6 meters. As at Mitu and 22 Zone, the Dumbwa area is covered by a mantle of copper-cobalt bearing overburden and metallurgical work on this material is in progress. Further drilling on MMA’s primary Solwezi properties target, the 22 Zone, was deferred by the Company pending receipt of the results of previously announced due diligence investigations by First Quantum Minerals. Midnight Sun will publicly disclose any material results of the investigation or any material change in their relationship with First Quantum Minerals.
? 6.27% copper over 4.5 meters.Note: The above reported lengths are intercept lengths and not estimated true widths. 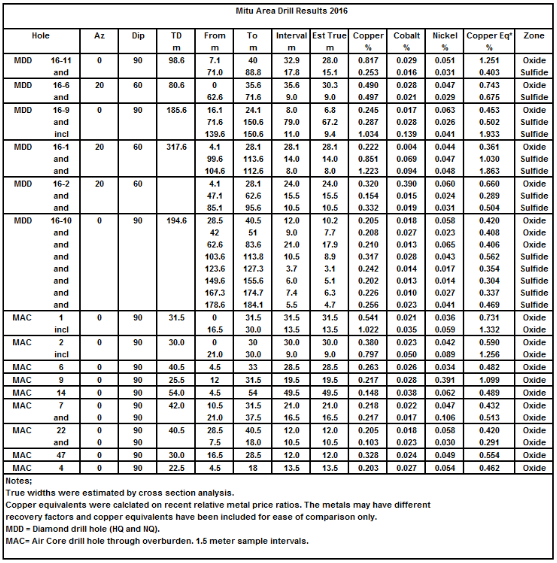 All drilling in the 2016 program was carried out by Blu Rock Drilling of Kitwe, Zambia and assaying was performed by Genalysis Laboratory Services, an internationally accredited lab.Qualified Control/Quality Assurance: Samples obtained during core drilling were transported directly to Genalysis Laboratory Services in Chingola, Zambia by Midnight Sun personnel for sample preparation. Samples were sorted, dried, crushed, and pulped before being sent to Perth, Australia for final chemical analysis using ICP-MS methods. All samples returning >10,000 ppm Cu were automatically re-checked by Genalysis. Genalysis is a fully accredited Laboratory and sample duplicates, standards and blanks were inserted by Midnight Sun personnel and by Genalysis.